Posted in Bright Ideas / Research on April 25, 2017. Over the years, online reviews have grown to become an important aspect of a successful digital marketing strategy for local businesses. It’s also been demonstrated that Online Reviews/Ratings can have a positive impact on ranking within search results. Two recent studies by Moz and The Local SEO Guide show the variety of ranking factors that influence local search rankings. Both of these studies show that online reviews influence where a business appears in Google’s Local 3-Pack results and in localized organic search results. But the impact of your online reputation goes far beyond just the power to influence search engine rankings. The greatest power of online reviews is their ability to influence the buying choices searchers make when looking through search results and selecting a business to contact. In our Local Consumer Review Study we found that overall star rating is the #1 factor that consumers pay most attention to when evaluating a local business on the internet. But how much do positive online reviews improve click throughs? With limited data publicly available to answer this question (especially in terms of how it impacts local search and localized organic search), we conducted a series of tests in Q4 2016 with our consumer panel. What impact do reviews and ratings have on CTR from Local Pack Results? What impact do reviews and ratings have on CTR from Organic Search Results? Click here to jump straight to the results of this study. Testing the CTR impact of reviews in real search results is very tricky. It requires manipulating real business listings and web pages to present a variety of review counts and rating scores to searchers. This action is considered ‘spam’ and therefore potentially damaging to businesses involved. Added to this, the tracking of clicks from specific search terms is virtually impossible due to incomplete data in Google Analytics (‘Not Provided’) and lack of granular data in GMB Insights (no keywords). Therefore we opted to set up multiple, virtual tests using mock-ups of Google search engine result pages (SERPs). 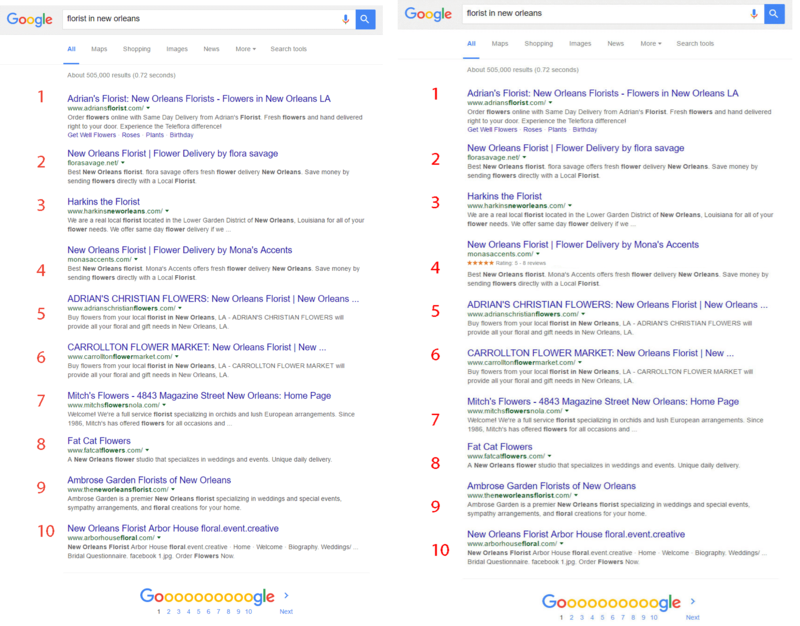 Some SERPs contained Google Local 3-Pack results and some just displayed localized organic results. We created variations targeting three different types of local businesses (Plumbers, Florists and Realtors) and varied both the star rating and the review count to ensure that we had a realistic spread of results to show to participants and to draw findings against. In total we used 18 variations of Google SERPs and presented these SERP mock-ups to different audience groups. The study was conducted October/November 2016 and 6,283 members of our consumer panel participated in the tests. The 6,283 consumer participants were based in North America — 72% from the USA and 28% from Canada. Control Group – A control group (30%) were shown SERPs with no ratings and review count displayed. Test Groups – The remaining participants (70%) were split into test groups and shown different SERPs with a variation of star ratings from 1 star to 5 stars. Participants were asked to imagine that they were searching for a plumber/florist/realtor and to click on the listing that they would be most inclined to click on. How Do Reviews and Ratings Affect Click-Through Rates on Google Local Pack Results? From the findings we can see that showing a positive star rating of 3+ stars has a positive impact on click-through rates. The higher the star rating the more clicks a listing received from Google’s Local Pack. We also discovered an uplift that earning additional high-star reviews had on lead generation from Google Local. Going from a 3-star to a 5-star rating can earn a business 25% more clicks. This alone justifies the extra investment of time and effort to generate more positive reviews. However, when a business had less than 3 stars displayed on their Google search listing, the click-through rate was less than if they have no stars at all. These results were consistent across the different business types and SERP variations that we showed to participants. The chart below looks at the same data as above but presents it differently. In this chart we show the variance in click-through rates for different star ratings vs. having no stars at all. You can see the impact that higher star ratings have on click-through vs. negative ratings. This chart shows the benefit that a 4- or 5-star rating brings a business. These businesses will earn more clicks from Google Local and drive more leads to their business — which should have a direct, positive impact on their bottom line. It also shows the damaging impact of negative reviews and ratings. Even if a business manages to get into the local pack, their chances of attracting clicks is significantly reduced if they have a negative reputation score. Business owners need to be aware of their reviews and star ratings on Google — and all other important review sites and traffic sources — and if they get negative reviews then they must take action to respond and try to turn negative reviews into positive ones. How Do Users Pick a Business from Google’s Local Pack? After participants clicked on their chosen result, we asked them a follow-up question: Why did you pick that result? This reaffirms the impact that positive reviews have on how searchers judge and select the businesses they click on in Google’s Local Pack. For 56% of consumers, their decision to click was directly influenced by the star rating. Some users still made decisions based on other factors, some very arbitrary such as liking the business name or choosing at random. When there are no listings in the SERP that contain ratings, then searchers have very little information to base their decisions on. Therefore, they make their choices based on more arbitrary factors. This highlights the usefulness and value of reviews to consumers because it helps them make a more informed decision. This also makes it more likely for them to pick a high-quality local business to work with. How Do Reviews and Ratings Affect Click Through from Organic Search Results? In this part of the study we asked participants to look at organic search pages and click on the result they would be most inclined to click on. We used the same set of industries and varied the star ratings and position within the SERPs. The Control Group viewed SERPs with no stars and the Test Groups viewed SERPs that contained star ratings. Having star ratings in organic SERPs is not linked to Google My Business like it is in the Google Local Pack. These ratings are part of Google’s ‘rich snippets’ which enhance search results with additional, useful information to help searchers click on the best results for them. To get stars to appear in organic search results requires marking up pages on the business’ website using Schema.org ‘AggregateRanking’ markup. Reviews and ratings should relate to specific products and services — not purely for the business itself. Find out how to get star ratings in Google organic search results. Again we see a positive uplift in clicks earned by search results that displayed positive star ratings. However, the uplift is less impressive and significant than we saw in the Google local pack study. Results that display 4- or 5-star ratings earned more clicks vs. no stars. However, the increase is only 4% and 7% respectively vs. 18% and 28% in the Google Local Pack. The larger set of results (10) in the organic SERPs certainly diluted the clicks that each results received (vs. the smaller Local Pack). Additionally, visually the star ratings don’t stand out as much in organic search results and therefore attracts fewer clicks. Across all the organic SERPs tested, we observed that 52% of users clicked on the top three results. So, just like they do in real-world searches, the top three search results listed get the lion’s share of the clicks. We also found that results with star ratings that appear lower down the SERP get much fewer clicks than the ones that appear higher up in the results. It’s clear that within organic results, positioning on the page has a much bigger impact on CTR than in the Local Pack because users have more search results to look at and select from. We also surmise that consumers are used to seeing star ratings in Google’s Local Pack results and therefore they watch out for them and are drawn more to click on corresponding listings with stars. Looking at the variance in CTR we see the reduced impact that star ratings have when users click in organic results. There is only a 16% swing in CTR between 1-star and 5-stars — whereas the Local Pack study found a 39% swing! But even though the impact isn’t as great, if a local business is able to get stars in organic SERPs, then they will secure additional clicks and more leads to their business. Promoting their positive reputation certainly won’t do their business any harm. The results of the study show the influence that reviews and ratings have on the decisions that searchers make. Negative ratings reduce clicks and positive ratings increase clicks. It’s not rocket science, but it’s further evidence of the impact that online reviews and reputation marketing has in convincing consumers to select a local business. A positive reputation can boost the visibility and make a business stand out in search results and encourage more consumers to contact them. Beyond search, reputation helps build trust consumers have in a business which impacts conversion both on site and through other marketing channels the business promotes their reputation on.